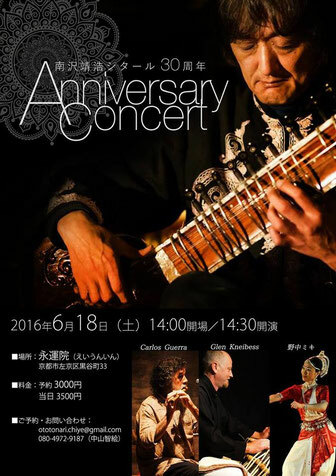 his 30 th anniversary concert, as a Sitar player. The event will be held at Eunin Temple, a favorite place for many musicians, artists and concert fans. Eunin temple is located in a beautiful deep greenery near Yoshida mountain in the north east of Kyoto. We look forward to welcome everyone. Eiunin is a very historic temple in Kyoto. Please check this WEB access site. Please click 【 join 】on Facebook event page. We will have a small market "snacks, drinks & plants ". Fresh vegetables, Rice balls etc. Mr. Yasuhiro Minamizawa was born in Shiga, Japan. In 1986, Minamizawa experienced Indian classical music in the holy place Varanasi for the first time, and started his education on the Sitar, string instruments, and the theory of Indian classical music under the tutelage of Dr. Shrawani Biswas. He then relocated to Varanasi and continued musical studies under his mentor’s supervision for several years, and with his teacher's recommendation he started to perform live in concert in India and Japan. His raisonne includes not only classical Indian music, but also a variety of musical and avant garde spiritual dance theme genres at multiple performing arts venues including temples, galleries, and auditoriums. In 1995, he became a founding member of 'Tenkoo Orchestra', a well recognized group in Japan and internationally, famous for its 'tribal rock' style of music performed by mostly tribal instruments. While with the 'Tenkoo Orchestra' he played the sitar at the 'World Jazz Stage' and at the 'Avalon Stage' in the 'GLASSTON BURY FESTIVAL' in UK in 1998 and in 'Green Future's Field' at the same festival in 1998 and 2000. In 1999 and 2002, the 'Tenkoo Orchestra' performed at the 'FUJI ROCK FESTIVAL', the largest festival in Japan, in front of five-figure audiences each year. 'Tenkoo Orchestra' has released five CD’s in Japan to date and all of them have been and still being re-produced for distribution. In Germany, one of their CD's, 'Heaven in the KOO', was released by IC/digit music GmbH., BFM87 4021-2, in 1997. As a concert soloist, he also performs Indian classical music in numerous venues, especially at Japanese SHINTO* shrines, and at Buddhist temples such as TODAIJI in Nara,Honen-in in Kyoto, etc. His sound from the sitar instrument renders a 'spiritual resonance' that only a skilled technique can generate. At his soloist concert performances, most of the audience was enchanted by the spiritual resonance and felt a 'spiritual unity', as he wishes whenever he plays the sitar. Mr. Minamizawa currently lives in the historical city Kyoto, Japan. *SHINTO is the way of the gods, based on respect and awe of natural phenomena, the sun, moon, weather, mountaintops, trees, rivers, which are considered to contain their own gods (Kami). I have been learning the Bansuri (Indian Bamboo Flute) since a very long time and I am yet at the very beginning. Being interested in Indian Philosophy, Meditation and Yoga, I did my first trip to India in January 1981. I saw a street performer playing a very long bamboo flute and I was amaze by the sound he made out of it. I decided to look for that type of flute (I didn't know even the name, just bamboo flute) and try to play it, as I was playing a western recorder at that time. But it was not easy at all. It took me many years to get use to the Bansuri. I learned from my first Guru: Sri Ram Hari Gurung from Nepal with whom I have been learning for over 20 years. He taught me very nice and clear and I realize years later how a nice teacher he was. I went to New Delhi in 1989 and started learning from Sri Harsh Wardhan too. He taught me very nice lessons about the Bansuri techniques and many nice compositions. I feel very grateful to my two Teachers. Indian Music is an oral tradition. We have to learn many exercises and practice them, before starting to learn or playing any Raga (The Indian Music Form). We also learn many compositions, to get used to the mood of any particular Raga. Years later, through the daily practice, we can start to understand the process of improvising the Ragas. Classical Indian Music is consider a kind of Yoga (Naada Yoga or Yoga of Sound) and the musician a yogi ( a practitioner). Learning is a very long process that never ends and last forever, even when we will depart from this world. Thanks to Music and to my Masters. Glen is currently based in Kyoto, Japan, and is active as a tabla player and tabla teacher. 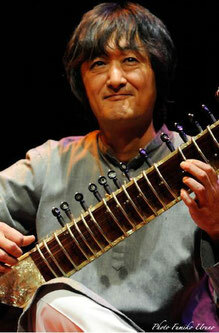 He performs regularly at concerts with many artists in the Indian classical music scene. Glen began formal music lessons in 1982 at the age of nine, playing clarinet for several years, and then the guitar. His interest in Indian Classical music began in 1994, when he commenced vocal studies with Narmatha Ravichandhira through the Academy of Indian Music Australia. As a guitarist, Glen completed the Advanced Certificate of Music Performance at NMIT in 1995, and he went on to gain a Bachelor of Music performance degree majoring in Improvisation at the Victorian College of the Arts in 1998. Please see glensguitarstudio.com for information about Glen's guitar playing and guitar lessons. Glen would like to acknowledge the lessons and support he received from fellow Australian tabla players Jeremy Tibb, Kate Tempany and Rodney Wright during 1998-99. In 2000 Glen travelled to India for intensive tabla studies with Sri Umakanta Dash of Puri, and went on to study Delhi gharana tabla with the late Ustad Anthony Dass, who was a disciple of Delhi gharana khalifas Ustad Gameh Khan, Ustad Munnu Khan, and Ustad Inam Ali Khan. More recently, Glen has studied tabla with Benaras gharana tabla players Pandit Lacchu Maharaj, and Pandit Ishwar Lal Mishra - who is one of the foremost disciples of the legendary Pandit Anoke Lal Mishra. In 2010, Glen again received funding support from the Australia Council for the Arts to study tabla with Pandit Ishwar Lal Mishra in Varanasi. Glen has also studied Lucknow and Benaras tabla with Sri Pankaj Kumar of Rishikesh, who is a disciple of Pandit Lacchu Maharaj and Pandit Kishen Maharaj. Other artists Glen has studied tabla with include Sri Akhilesh Gundecha, Sri Vibhash Maharaj, and Sri Kishore Pande. In 2000/2001 Glen continued vocal studies in Chennai with Smt. Prity Chakraborty Ghose. Since that time Glen has also studied raga and vocal with famous dhrupad singers, the Gundecha Brothers. In 2003/2004 Glen was awarded funding from the Australia Council for the Arts and the Ian Potter Cultural trust to undertake further tabla studies in India with Ustad Anthony Dass. During 2004 and 2005 Glen lived as an artist in residence at "Dunmoochin", an artists community in Melbourne's outer suburbs, which was set up by well known Australian painter Clifton Pugh in the early 1950's. During his time at Dunmoochin, Glen devoted himself to intensive tabla riyaz. Glen served for several years as a committee member of the Nataraj Cultural Centre. The Centre organizes the annual Spirit of India concerts featuring excellent artists from India. During his time with the Centre, Glen assisted in the organization of concerts featuring such luminaries as Pandit Shiv Kumar Sharma, Pandit Yogesh Samsi, Mandolin U. Srinivas, Mandolin U. Rajesh, Dr L. Subramanium, Pandit Rajendra Prasanna, Shubh Maharaj, Manjiri Kelkar, Anuradha Kuber, Dr N. Ramani, and many others. Miki Nonaka was born and raised in Mie Prefecture, Japan. She graduated from Saga Junior College of Art （The current Kyoto Saga University of Arts) with concentration in Nihon-ga painting. Following matriculation, she worked in dyeing and began her study of the basics of one type of classical Indian Dance, Bharatanatyam, at the Center for Indian Dance Research (Vasantamala) in Kyoto for 9years from 1977 to 1986. In September of 1990 at Triveni Kala Sangam she studied Odissi Dance with Odissi Guru, the late Guru Ramani Ranjan Jena. 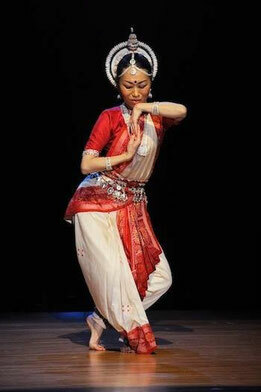 In March of 1992, she danced Manch-Pratistha and returned to Japan. Since that time she has made regular trip to India to study under the direction of the late Guru Ramani Ranjan Jena till in 2016 when he passed away. She began solo performance in 1992 and has established an Odissi Dance Studio Kamala Kala Pitha Japan branch where she is teaching as well as working to support and encourage the next generation of dancers.